The objective of this research is to establish the systems engineering which balances mission success with reduction of development costs, by researching, development and utilization of the world's top-level information technology and computational engineering. This will make possible a space mission that currently seems infeasible in terms of development costs and lead time. As a first step, we will contribute to developing a new H3 rocket in an efficient and reliable manner. In parallel, we will research future satellites and reusable space transportation systems and support space projects with the use of previously developed technologies. To innovate on the systems engineering for space systems, we improve the computational engineering and verification technology, achieve the best designs and operational margins and formulate the most efficient development and operation plans. We also achieve the efficient, faster and low cost development and operation, and enable to create the new variable space mission. To realize the contradictory requirements both of the mission success and reduction of the development and operation cost for more complex, advanced missions, we will support the space projects and challenge the innovation by the common "methodology of the development and operation (i.e. Engineering)" instead of the performance or cost of individual equipment or subsystems. 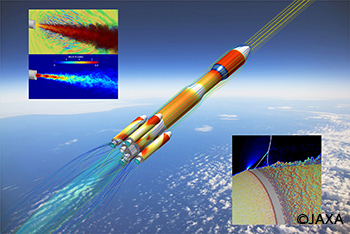 We will develop and perform high-fidelity numerical simulations for various physical phenomena associated with rockets and satellites such as acoustics, combustion, multiphase flow, and dilute fluid, making the most of JSS2 (JAXA's Supercomputer System generations 2), also called "SORA"
As space systems continue to become larger in scale and increasingly complex, we will develop improved verification technologies that can visualize the requirements and designs of systems and software in logical, and efficient ways to ensure mission reliability and shorter lead times. We will develop engineering technologies that identify and assess risks and provide reasonable risk reduction measures.